This story has began once upon about year 1998, when the young guy Marian went to a techno party in Dresden. There he met a crazy girl (in cow clothes) from another world… and she told him everything about the culture around Goa / Psychedelic Trance and gave him a tape with that music… and it was happen… he was totally infected and DJ Merry:) was born! 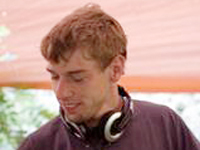 From then he putted all his energy to build up the Goa / Psychedelic Trance scene in Dresden, together with his friends… At first they organized some small and illegal parties and later they founded the Partycrew Insulin Productions, which name has been shooting up in Dresden and in the German trance scene. So they arriched up to 2.500 people on parties with partly psychedelic trance, organized 2 Germany wide DJ tours and got their own trancefloor at the legendary "Nation Of Gondwana" festival (2001). His style can be described as something between "twilight" and "happy dark". Kicking nightime psytrance, which is really blasting at peak moments, but not too evil. But besides that he has the right music for every time of the day and has a passion for well produced emotional morning music far away from the cheese which can be heard at parties way to often.